Congratulations to the following winners, emails have been sent to you all. Please check back for our next DVD competition starting in the next few weeks. Star Wars Battlefront 2 & revenge of the Sith DVD released! Revenge of the Sith DVD available now! You can now order the final chapter of the saga - Star Wars Episode 3 on DVD in the UK from Amazon.co.uk. or in the US from Amazon.com in either Widescreen / Full Screen . This set will also have plenty of extras such as deleted scenes and the making of the film featurettes. You can view more details on the Revenge of the Sith DVD page. This figure, specially released to celebrate the release of the Revenge of the Sith DVD is now available to pre-order only at StarWarsShop.com , and comes with a unique, specially designed backer card and features logo and artwork from the Episode III DVD release. Available to pre-order now, these 2 sets of individually packaged Astromech Droid Action Figure 5-Packs are sure to be popular! Each droid has several points of articulation, with articulated "feet," moving domes, retractable third legs, and all sorts of light-up eyes, clear domes, and other features that bring these unique droids to life! Also for just $10 more you can get a special bundle that adds the Holiday Jawas exclusive as well! Click here to pre-order from Entertainment Earth! The 2 disc DVD release of Revenge of the Sith has been announced for 31st October/1st November this year. More details of what's on the disc, special features and more to come soon. 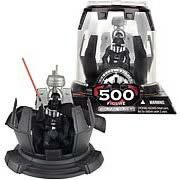 Exclusive 500th Darth Vader released! Due for release shortly, the exclusive Star Wars 500th Action Figure Darth Vader Meditation Chamber features:- Meditation Chamber from Empire Strikes Back, Helmet Dome with lever that lowers helmet onto Vaders head, Lightsaber, Cloth Cape, removable right hand and removable helmet. Unlike other Hasbro exclusives, this figure is available in the UK via Amazon, and worldwide through Entertainment Earth, though Toysrus.com have already sold out.You can click the links below for more info or to order this figure. Don't forget to browse our Revenge of the Sith Figures section here - we are running out of figures fast, only £6.99 including UK mainland P&P! Site Feedback We're interested in featuring more Star Wars subjects of interest and would like to know what you would like to see more of on this site. For example, more on vintage figures, Star Wars identification guides, more checklists, more photos of toy ranges, more content from the movies etc. Please let us know by emailing us here. Hasbro Jawa Sandcrawler vehicle back in stock! At long last the Jawa Sandcrawler is available to buy again here This detailed vehicle comes complete with two jawa action figures and a droid action figure and is sure to be a big hit with fans. Beginning today you can pre-order the exclusive Comic-Con 2005 Holo Leia for pickup from StarwarsShop.com here . Be quick though as these exclusives have sold out fast so far! Our competition has now closed and the winners list can now be viewed here. Congratulations to the winners and thank you to all those who entered. Look out for another competition soon! There are now a wide selection of ROTS posters & photos available. Click here to view the star wars posters for sale worldwide. We've had a lot of emails asking how to join the Official Star Wars Fan Club - you can find out here! You can now view the range of Galactic Heroes including new Episode III figures available worldwide here. Revenge of the Sith Movie released! Well the big day has finally arrived! We hope you all enjoy the film. Odeon cinemas are giving away one of four ROTS posters for every repeat viewing you make at their cinema. You can now find a large selection of ROTS posters, photos & filmcells available worldwide, click here to view them.